— A NASA jumbo jet used to ferry space shuttles around the country has arrived in Florida, where for the last time it'll be paired with one of the winged spacecraft for a transcontinental trip. 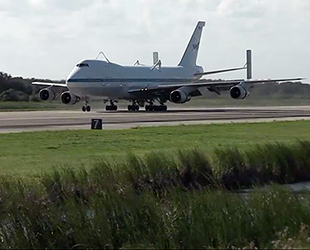 On Tuesday (Sept. 11), the modified Boeing 747 Shuttle Carrier Aircraft (SCA) landed at Kennedy Space Center in Cape Canaveral after flying in from NASA's Dryden Flight Research Center in southern California. The jetliner will be used to carry space shuttle Endeavour to Los Angeles for its display at the California Science Center (CSC). 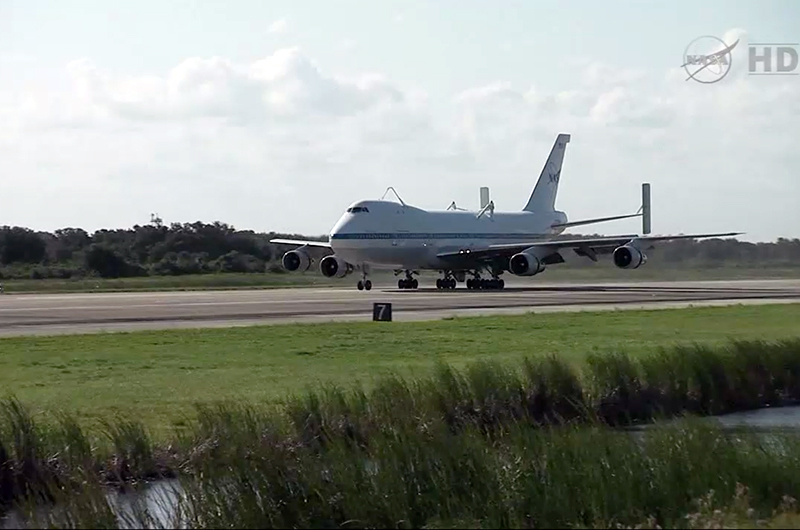 The SCA touched down at 5:05 p.m. EDT (2105 GMT) at Kennedy's Shuttle Landing Facility, on the same runway where Endeavour returned from space after its 25th and final spaceflight on June 1, 2011. Next Monday (Sept. 17), the orbiter, mounted atop the SCA, will take off from the 15,000 foot (4,572 meter) concrete strip on a three-day trip to Los Angeles International Airport (LAX). Before all that can happen though, Endeavour first needs to be mounted atop the carrier aircraft for its ferry flight to the West Coast. That process will begin before dawn on Friday (Sept. 14), as the shuttle is rolled out to the runway to a gantry-like structure called the Mate-Demate Device (MDD). There, it will be attached to a sling and hoisted by crane into the air. 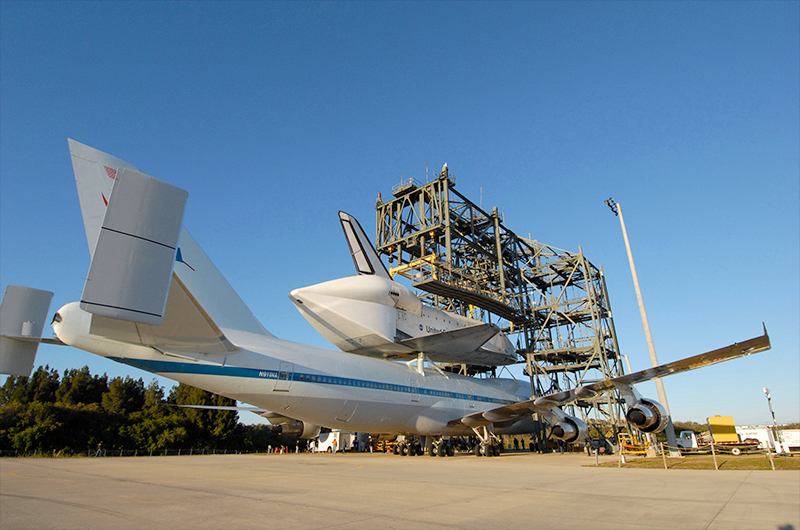 The SCA will then taxi in underneath the shuttle, so Endeavour can be lowered down onto its back. 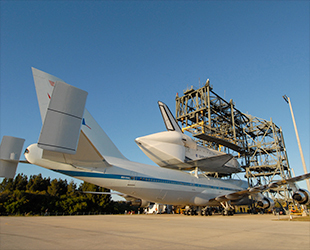 On their way to Los Angeles, the SCA and Endeavour will fly over other NASA facilities and many local landmarks. The flight is planned to stop over in Houston for two days, in El Paso, Texas to refuel, and spend a night at Edwards Air Force Base, which was the shuttle program's California landing site for 30 years, before touching down at LAX. 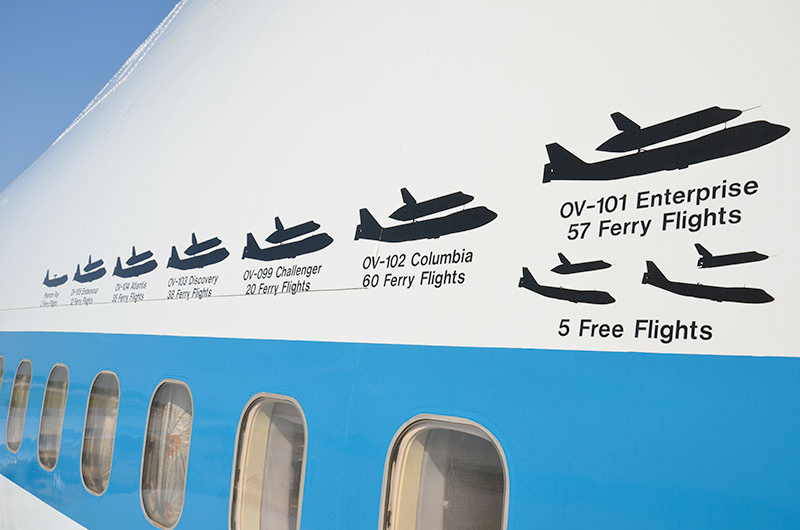 When it touches down at LAX on Sept. 20, NASA 905 will have taken to the air carrying space shuttles a total of 223 times, a count represented by the vinyl logos affixed to its forward fuselage. 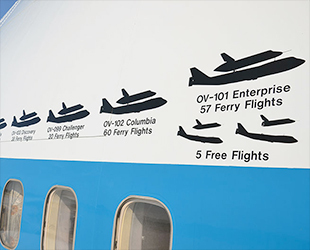 In addition to its many flights during the course of the shuttle program, the SCA carried Discovery to Washington, D.C. and the prototype Enterprise to New York City before its current and last assignment to ferry Endeavour to Los Angeles.